Content marketing is quickly catching the interest of marketing experts everywhere. But just what do those two simple, yet powerful words mean? Believe me when I say it’s a lot more than you think! If you haven’t let your curiosity get the best of you and typed “content marketing” into the Google search bar, just know there are more results for one complete definition than you can count. The reason as to why there is not a straightforward definition to content marketing is easy—there isn’t one! Throughout this article, our agency’s content marketing expertise is brought to bear to help you understand why one simple definition could not possibly cover the entirety of content marketing and all that it has to offer. How are you supposed to develop content that triumphs over your competitors without a strategic approach? That is why content strategy is our first step on the journey through the core areas of content marketing. 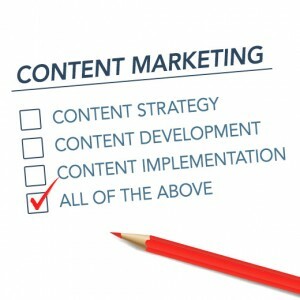 Content strategy encompasses the planning, delivery, and managing the process of developing your content. This step acts as a blueprint for what you plan to bring to the web (and in some cases print) and how you plan on delivering information that increases the knowledge of your reader in a profitable way for your business. Keep in mind that it is more than likely that there are a number of pages already filled with information about your topic. So find ways to deliver the content in a unique manner. In the end, reflect on your content strategy and find out what it is that separates you from the everyday blogger. If you didn’t know already, content development is much more than it reads. 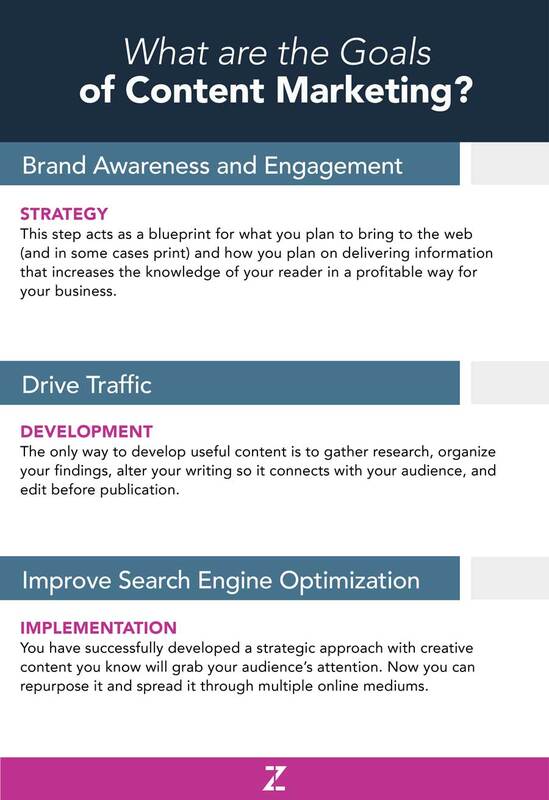 The only way to develop useful content is to gather research, organize your findings, alter your writing so it connects with your audience, and edit before publication. The content you develop should successfully spread awareness about your product or service, but not by pitching and talking up how you can get it for “the low price of $19.99.” The content should flow naturally, have a consistent voice, and change or enhance the behavior of your reader. But it doesn’t stop at writing unique content. A true content developer connects with their readers through numerous online mediums such as infographics, images, videos, and much more. Think about it! Nobody wants to read through 1,000+ words when all it takes is one eye-catching infographic to do the job. Speaking of infographics—how exactly does a picture better explain relevant information better than a page full of content? Our brain processes visual information thousands of times faster than text! I’m not trying to say visual content is more important than written text, but it does have its advantages. Visuals are an important way to help differentiate your content from the next “Joe Shmoe Company” who is writing about the same topic you are. Visuals are a perfect way to deliver an abundant amount of information in one quick snap shot. Are you wondering where to start? 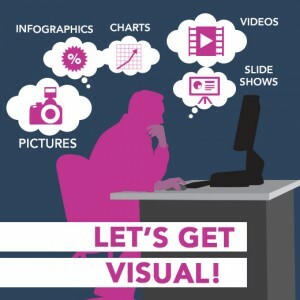 After writing your content, take a moment to visualize your content in a way that can capture what you have to say in an appealing image, infographic, chart, or slide show. You have successfully developed a strategic approach with creative content you know will grab your audience’s attention. But now what? You should now repurpose it and spread it through multiple online mediums. For instance, you wrote an informative blog that also has a short video clip for people to watch. You can add the video to a YouTube channel and include the link to the blog underneath. Another example would be to post a few social media updates to encourage your followers to read your blog and share whenever possible. Turning one concept into content you can use elsewhere may be difficult, so if you happen to run into a few obstacles while implementing your content, don’t let it stop you from getting it in front of more viewers! 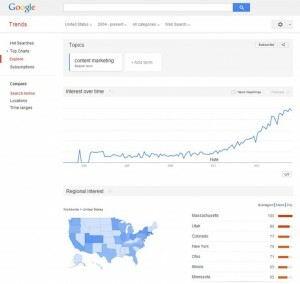 The demand for content marketing has skyrocketed over the last few years. If there is one thing to remember about content marketing, it is to always keep your audience in mind! This is what drives a content developer to write compelling content the readers will truly find interesting and informative. While your own goals of content marketing will differ from others, there are a few that every business should strive for! Brand awareness and engagement. One of the primary goals of advertising. The extent to which customers can easily identify your brand in the blink of an eye is every business’s dream. If done correctly, brand awareness can successfully spark a thought and associate a positive experience or peaked interest, followed by profitable action for your business. Here are a few ways you can distribute content through a variety of channels, and help spread brand awareness to your audience directly. Blogging—influence and inform your readers to prove you are the industry’s experts. Email Newsletters—build an audience and send them the newest information related to your business regularly. Social Media—post engaging content and put a personal touch to your brand. Visual Content— create infographics, videos, or slide show decks to grab the attention of your audience and increase their confidence about choosing your brand. An expert is someone who has comprehensive knowledge and the necessary skills to excel greatly in a particular area. Is that you? Is it your brand? Prove it! Effective content marketing not only spreads brand awareness, but develops trust and a solid connection with your audience. Most likely, you aren’t the only business competing for your audience’s attention, but by providing proper customer education you can easily build your brand loyalty. You’re right, nobody likes a show off, but don’t be afraid to call yourself the experts! If you don’t feel confident behind your brand, why should your audience? Show that you are experts in the industry by writing informative blogs, posting your thoughts and ideas about trending industry topics, and contributing to conversations with industry influencers. Let’s face it. You will never be able to demonstrate how your brand may be the best by individually speaking face-to-face with numerous influencers from around the country. However, you do have the opportunity to write valuable content about your brand on the web to potentially reach the screens of millions of people around the world. The importance of a brand is critical to your business. With that being said, take your time and develop content that will transform your business into the trusted source you see it as. 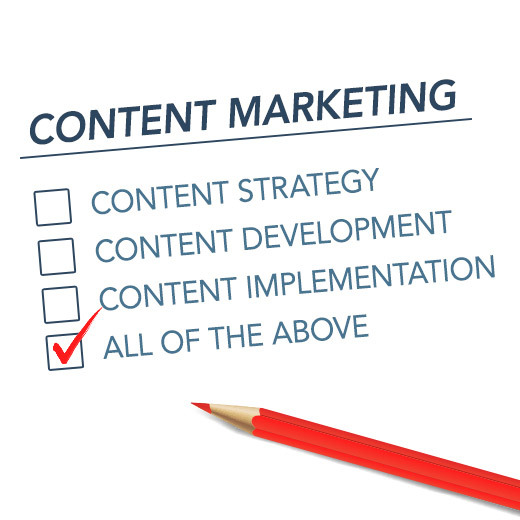 Content is a requirement for inbound marketing. One of the primary purposes for creating valuable content as a marketing technique is to drive traffic back to your site where your reader will eventually be converted into a new customer. Captivate your readers with your valued content, and provide a constructive reason they should click-through to your website. Here are a few methods you can integrate into your content and help increase the drive of your customer traffic. Don’t forget to make the site you plan on directing your readers to a credible one! Without a well-developed user experience, your visitors will click the red X in the top right corner of their browser seconds after landing on your site. Almost every website is in its own combat to conquer the ranking of search engines (especially Google). Writing valuable content is great, but getting it in front of the eyes of the right audience is even better. Now you see why one definition could not simply sum up all of the goals content marketing entails! 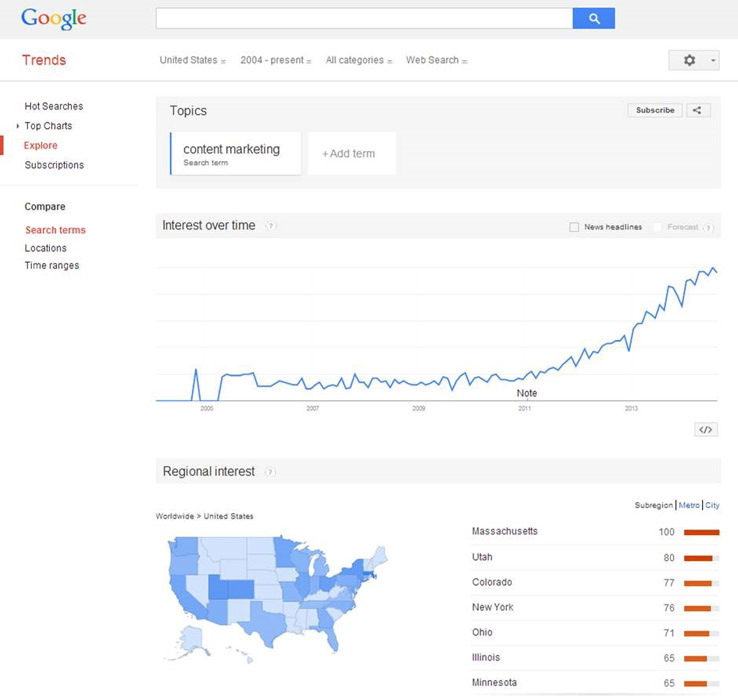 Content marketing is meant to educate, entertain, and provoke questions! Don’t sound “spammy” and lose your credibility by only promoting your brand and nothing else. Engage with your audience and always keep their concerns in mind. Remember to take advantage of all the online content mediums available to you. From blogging and newsletters to interactive social media posts, you can reach and achieve the goals of content marketing. If content marketing is done right, it can truly be a form of advertising that your audience will continue to want more of! Are you a student looking to take the first step into content marketing? Check out the benefits of a hands on content marketing internship and apply at Zion & Zion today. Prev post : What is jQuery?